Delighted to be bringing you another live performance from Lisbon – an intimate, largely acoustic affair that was well-worth writing home about: Espírito Nativo. This sort of gig just doesn’t really exist in London – well, maybe it does, but I don’t get brought there…The fact that there were only about 15 people in the audience was a bonus, creating an intimate atmosphere that allowed the power of the music to resonate much more strongly than if it had washed over an impersonal melée. 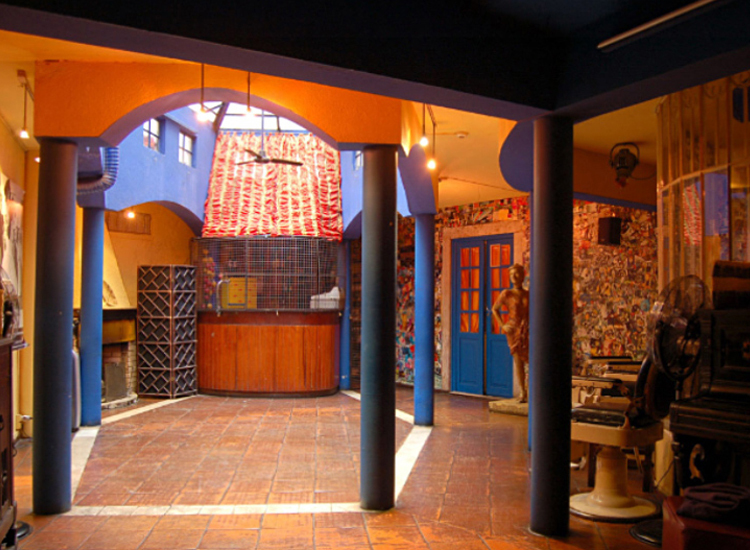 Chapitô is a remarkable venue, with multiple zones and purposes – bar, restaurant, terrace, library, stage (and as you’ll see from the website, a circus school!). The restaurant is apparently most excellent, as it should be for those prices, which are not catering to a local audience. And this post gives you a good indication of the appearance and appeal of the venue. The band were represented by 3 musicians wielding maracas, guitars and, occasionally, a donkey’s jaw bone – yes that’s right! It’s called a quijada, and you can read more about it here. And you can see it in action in this song. Naturally, the phone recording doesn’t do justice to the sound. I also cannot really do justice to the charm and charisma of the female lead, whose beaming smile and passion brought the music alive and entranced all of us in the audience. She even managed to coax some of us (not your terribly British correspondent of course) into singing along with a chorus line! You can get a better idea of her powerful performance style in the video on their website. The two male musicians were also very accomplished, the violinist frequently transforming the violin into a percussion instrument, knocking not only the body of it, but also the scroll & pegs. My Portuguese is not yet sufficient to be able to relate her narrative between songs. But the general gist was that they aimed to transmit their passion for Latin American music, from across the continent, which they did most ably. And it only cost €10 for 6 drinks! I’ll be back for sure, and have eventually navigated the labyrinthine website to find the listings here, so you can check it out on your next visit to Lisbon.